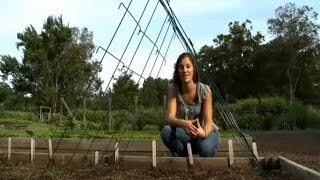 Cucumber and Pea Trellis Kit is rated 4.2 out of 5 by 5. Rated 5 out of 5 by Pole beans usage from trellis kit I am using it for pole beans and they just love to climb up the netting. It makes it so easy to pick from and it acts as a shade for the broccoli and cauliflower . Rated 4 out of 5 by Jim41 from Great Item I purchased this based on size of 86" wide that was given on website. On arrival it measures 60" wide. I've got 2 feet of beans sprouting with no place to climb. I've asked that the measurement be given correctly on the website. This is well made and beats building one out of wood. Great paint which should last for a number of years. It will collapse after growing season into small bundle if you want to do so. You will have to purchase additional zip ties to put the plastic mesh or cloth webbing shown in picture back on for next growing season. Except for the wrong measurement I would give it 5 stars. I'm glad I bought two. Rated 2 out of 5 by longbchdirtbag from Great frame, netting was opposite of great. Decent frame, netting is poor quality plastic, nothing like what is shown in the stock photo. I was expecting a nice sturdy netting but was disappointed by a rolled up piece of plastic that was terribly hard to unfurl. I required assistance to get it unfurled, than discovered that it was not trimmed to specifications that the instruction guide indicated, making it even more difficult to get on. The plastic was so rigid it required stakes to keep the bottom near the ground or it would have just furled up again. And the method of attachment was zip ties. Yes, zip ties. If anyone is looking for a nice trellis, this is not it. Maybe if you are willing to buy the frame and than get some separate netting elsewhere it could be a complete product. Rated 5 out of 5 by Pianogirl from Great Support I just received this Cucumber and Pea Trellis Kit. It is so sturdy and so easy to assemble. Thank you! Rated 5 out of 5 by BurpeeGardenExpert from Trellis kit supports the heaviest of vines So many of our customers have asked us for a strong trellis to help them grow cucumbers, peas, beans and other vine type vegetables and flowers that require a strong support system. We designed this special trellis kit to support even the heaviest vines. We found increased yields in less space in our testing.